Over the years we've developed a systematic process for designing and fabricating our custom skid systems. It ensures each system we build is inspected for quality, functions exactly as you need it to, and includes everything you need for long term operation. Get everything you expect, nothing you don't. All systems are designed using Autodesk Inventor to create a virtual model, allowing equipment interfaces and fits to be checked prior to assembly. Special attention is placed on component location to ensure proper functionality, maximum serviceability, and reduced operator risk. Leveraging over 75 years of distribution experience and component know-how, we carefully size and select the right mix of equipment for optimal performance. After a bill of materials is developed, we work with our manufacturer partners to source at below market prices. During the fabrication and assembly, experienced technicians and engineers collaborate to recommend potential improvements to increase serviceability or function. This yields superior workmanship and ensures all systems are built to the correct specifications. All control panels are built in our UL listed panel shop. A well designed system requires an equally well designed controls package. Our Controls Engineers design control panels to be safe, state of the art, easy to use and long lasting. We can match components to your plant specifications, or our experienced team will select from leading technology providers like Allen Bradley, ABB and Phoenix Contact. Panels are built in our onsite UL Panel Shop. PLCs and Operator Interfaces are programmed with a focus on stable process control, ease of use and reliability. Our engineers thoroughly inspect and test all systems before they are ship out. System trials are completed in-house in our test cell with the subject chemicals or water to ensure proper functionality. Client visits for a final test and inspections prior to shipping. We create comprehensive manuals which include a bill of materials, 3D mechanical and electrical drawings, P&IDs, equipment datasheets, and start-up/operating instructions. All documentation is developed in an electronic format and utilizes useful screenshots and photos to enhance key topics. Proper installation and start-up is vital to the long term operation of their system. 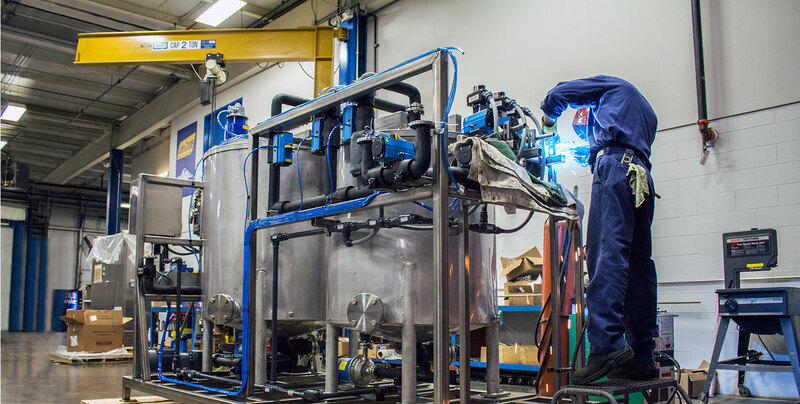 We offer experienced mechanical and/or controls personnel to help install and start-up your Optiflow™ skid systems upon request. We support our systems by providing lifecycle services such as troubleshooting, maintenance, reconditioning, and asset tracking.